Big Buddha Seeds is a seed company from the United Kingdom. They have 16 types of feminized cannabis seeds in their catalogue, including 3 autoflowering strains. 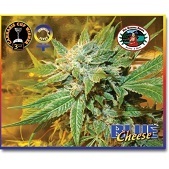 Big Buddha Seeds is specialized in Cheese and crossings with Cheese genetics. Their most popular strain is Big Buddha Cheese, the strain with which they won the High Times Cannabis Cup in 2006 for 'Best Indica'. California Orange Cheese is a feminized indica-dominant hybrid of two well-respected and powerful strains. Easy growth and pathogen resistance make this an ideal low-maintenance crop for achieving nice full jars. Blue Cheese is a smelly, but excellent crossing between Blueberry and Cheese. 100% indica, sweet OG Kush variety (Tahoe cut) by Big Buddha Seeds. Cheesus is a crossing between Big Buddha Cheese and God Bud, a Canadian strain. Autoflowering strain from Big Buddha Seeds which is ready after 8-10 weeks from seed to harvest. Bubble Cheese is a crossing mixing the genetics of Bubblegum, Cheese and Kush. Buddha Haze is a 90% dominant sativa strain with Amnesia, G13, Super Silver Haze and Manga Rosa genetics. Great crossing which brings new and old genetics of pure fuel together. Cheese Dawg is a mostly indica strain. Great addition to the catalog of Big Buddha Seeds. L.A. 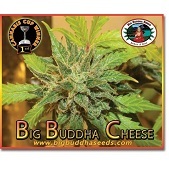 Cheese by Big Buddha Seeds boasts award winning genetics and a strong old school highs. This is a must try for Cheese lovers as it is an elegant twist on the old favorite. She has quick growing times, great yields and connoisseur quality product. This is one that you do not want to miss out on. An amazing example of an autoflowering hybrid at its best, Chiesel Automatic brings together New York City Diesel x 3rd Generation Cheese autoflowering in a highly special mix. Packed with a tantalising array of flavours and aromas, she will have you hooked right from the word go. To top all that off, Chiesel Automatic is ready to harvest in just 10 weeks! A mysterious mix of California O.G Kush x 98 Bubba Kush (reversed) come together to create Buddha Kush OG - a combo of which its creators (Big Buddha Seeds) are very proud of and you will be too. Ready for harvest in just 10 weeks (or less), she produces bud of top-shelf quality that will have kush lovers everywhere completely relaxed. The super intense flavor of Blue Cheese is now available in an autoflowering version thanks to the good folks at Big Buddha seeds. This vigorous grower is ready to harvest in around 10 weeks and produces some of the finest bud imaginable. The potent mix of Indica and sativa pave the way for a super pleasant high. An amazing autoflowering specimen, spawned from the award winning loins of Big Buddha Cheese and a 3rd generation auto (reversed). Big Buddha Cheese Automatic is truly a cosmic wonder. Praised for her super fast growth and authentic taste, this old skool, skunky Indica possess all the right components to become a legendary strain in the near future. The best parts of the Original Cherry Pie combined with the legendary Bubba Kush make Cherry Moon Pie by Big Buddha Seeds one of this year’s most crave-worthy strains. When you can get a taste of her scrumptious fruit flavour and can enjoy the uplifting happy high you will no doubt want to keep coming back for more: Cherry Moon Pie is an indica like no other! Sch'Lemon Cake is the latest in a long line of Cookies strains. To create this one, Big Buddha selected an outstanding Sunset Sherbet (mother of Gelato) and crossed it with a super funky Lemon Skunk. The happy highs are all Cookie, but the aroma is nothing like a Thin Mint. Think lemon bundt cake with a sugary glaze. Silver Cheese is the crossing between two of the most loved strains in the collection; the Big Buddha Cheese and the Super Silver Haze. Crossing of Cheese with Friesland Indica, an old skool indica strain from The Netherlands. Compact and discreet autoflowering indica strain producing impressive yields. Big Buddha Seeds is the brainchild of founder Milo Yung, who grew up in British suburbia appreciating the finer points of cannabis from a young age. However, it wasn’t until he was 18 that this passion became fully ignited. With a cutting supplied by a friend, Milo attempted his first indoor grow, and it set in motion cannabis history. From this point, all free time was dedicated to honing skill and growing connoisseur level cannabis. Through work in the industry, and developing contacts, Milo eventually got his hands on an original Cheese clone, one of the most fiercely guarded and exclusive strains of the UK. Having grown with the clone, and experiencing its quality himself, Milo knew exactly what he had to do – make it available for all the world to enjoy. Thus started Big Buddha Seeds. Today, Big Buddha have refined and honed their original Cheese into one of the best varieties it is possible to get hold of, also using it to produce a number of top-shelf hybrids. The result is world recognition and many awards – making them well worth any grower’s time. Great examples of their work include Big Buddha Cheese, Blue Cheese, Buddha Tahoe, and Buddha Kush OG – all of which scream quality! Big Buddha Seeds take packaging extremely serious. So much so that they have made a custom package producing machine in-house, and its ability to keep cannabis seeds safe is next to none. Each set of seeds is housed in a shock, temperature, and moisture resistant Buddha, which in turn is carefully sealed in a blister pack along with a playing card that denotes the strain within. The Buddha itself has a resealable head, meaning seeds can be stored in the original packaging while not in use. However, as the Buddha is often transparent, be sure to store it in a dark place. 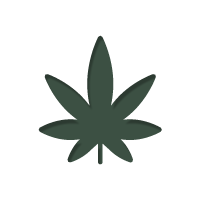 Big Buddha Seeds’ cannabis seeds are available in quantities of 5, in feminized and automatic varieties. Please note: It may be the case that you receive Big Buddha Seeds’ older style of packaging, while stocks last. As one of the premier producers of Cheese cannabis seeds, it is no wonder to hear that Big Buddha Seeds have won multiple awards over the years. 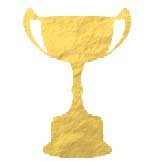 Here are some of their top strains, and the awards they have won. One of the most popular strains in the UK, Big Buddha Cheese has an unmistakably pungent taste and aroma that pay homage to its name. A crossing of the original and closely guarded Skunk #1 Cheese with an undisclosed Afghani, this indica dominant beauty grows strong, flowers in 7-9 weeks, produces big yields, and is able to relax the body and mind in its entirety, while uplifting mood. Blue Cheese combines the dank tones of Big Buddha Cheese with the delightful fruity twists of Blueberry. Both parents are renowned and award-winning in their own right, and their offspring is no different. The combination of these genetics results in a big, bushy beast that produces amble yields in 8-10 weeks. Her bud produces a classic Cheese flavour with a fruity twist, and she induces a functional and extremely euphoric high. 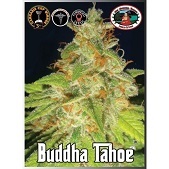 One of the few 100% indicas still around, Buddha Tahoe is the child of Big Buddha Seeds’ original Tahoe cut of OG Kush. These cannabis seeds are quite literally a bit of living history, and have been selectively bred over the years to exemplify the very best of this OG Kush. With a flowering time of 8-9 weeks, a tangy, lemony flavour, and a deeply relaxing high, there is a lot to love about Buddha Tahoe! 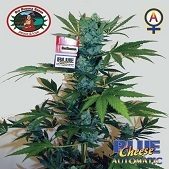 As the name suggests, Blue Cheese Automatic has all the great qualities of the original Blue Cheese, but in an easy to manage, fast growing automatic variety. Able to go from seed to harvest in roughly 10 weeks, Blue Cheese Auto maintains the pungent yet slightly fruity flavour of its namesake, as well as the euphoric and uplifting high. As she is an automatic, she can also be grown multiple times throughout the year – which is sure to put a smile on many grower’s faces.